At Southwest Dental Care, we want you to have the smile you deserve as efficiently and effectively as modern technology allows. 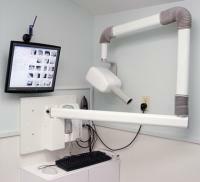 We are proud to offer our patients the following technologies in-house. Digital radiography presents several advantages compared to traditional dental photography, including: the speed at which we are able to view images and the ability to reference your x-rays at any point during your care. The full-colour, detailed photos provided by our intraoral cameras can go a long way in helping our team determine the best possible dental care plan for you – and help you feel more involved in your treatment. The iTero® Element™ Scanner is a digital impression system that eliminates the need for messy putty in your mouth. The Periowave Diode Laser is a non-invasive, safe tool which helps our staff identify the signs of tooth decay much earlier than other investigative techniques. The VELscope uses tissue florescence to reveal cellular, structural, and/or metabolic activity changes that are often directly related to disease processes occurring inside the tissue.